Current Science publishes special sections on diverse and topical themes of interest and this has served as a platform for the scientific fraternity to get their work acknowledged and highlighted. 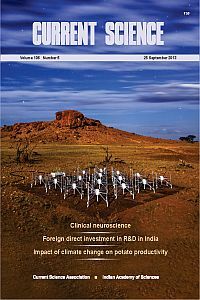 Some of the special sections that have been well received in the recent past include remote sensing, waves and symmetry, seismology in India, nanomaterials, AIDS, Alzheimer’s disease, molecular biology of ageing, cancer, cardiovascular diseases, Indian monsoon, water, transport, and mountain weather forecasting in India, to name a few. Contributions to these special issues ‘which receive widespread attention’ are from leading scientists in India and abroad. Current Science is indexed by Web of Science, Current Contents, Geobase, Chemical Abstracts, IndMed and Scopus. The Impact Factor of the journal for the year 2016 is 0.843.